Coinciding with the Association of Cruise Expert’s fifth UK Cruise Convention, held in Southampton last week, the UK’s Passenger Shipping Association posed an interesting possibility, noting that Europe could become the world’s largest cruise source market by 2020. Meanwhile, down under, the Australia/New Zealand market produced 509,578 cruisers in 2010, making it the fastest growing in the world. And San Diego licks its wounds as it loses a second ship to Australia. We also report on last week’s UK Cruise Convention. Could Europe Become the World’s Largest Cruise Market? The PSA suggests that while North America today produces twice as many cruisers as Europe, a repeat of the rates of growth enjoyed in Europe over the past five years, if continued over the next ten, could see it becoming the world’s largest source market by 2020, or in about eight or nine years time. By then, Germany, with its higher population, larger outgoing tourist market and bigger economy, may also have surpassed the UK to take the number one spot in Europe. Italy, France and Spain will also continue to grow. The number of Europeans cruising passed 5 million in 2010, reaching 5.45 million, or 11% more than 2009. The European market has also now maintained double-digit growth for four years in a row, while the more mature North American market has slightly declined, stagnated or shown a generally lower rate of growth than Europe. The PSA gave no forecast for what the numbers might be for 2020 however. In spite of the economic crisis that began in September 2008, European passenger numbers have doubled over seven years, growing from 2.67 million in 2003 to 5.45 million in 2010. Of this, the UK accounted for 1.62 million (6% growth in 2010) and Germany 1.22 million (19% growth), while Italy at 889,000 grew 11% and Spain at 645,000 grew 10%. Bringing up the rear is France at 387,000 but even that market is beginning to perk up and has now grown at a rate of 12% for three years in a row. The generally low penetration levels of cruising outside North America also offer the promise of potential future growth, especially with rising incomes and the much longer holiday periods enjoyed by Europeans in comparison to North Americans. The cruise industry is also growing rapidly in other markets such as Brazil and Australia, which have both grown by up to 25% or even a third in different years, and is showing promise in areas such as China, Russia (which at one time operated the world’s single largest fleet of cruise ships) and India. In order to increase market penetration, cruise lines are building larger ships and adding more onboard amenities, especially those that appeal to children, and therefore families, and also spa facilities, more flexible dining arrangements, ship-wide Wi-Fi and more entertainment facilities that appeal to adults. Meanwhile, temporarily at least, the number of Americans wanting to fly to the Mediterranean to take a cruise has suddenly dropped. With higher airfares and the recent events in North Africa and the Middle East, some lines have found that they are having to discount fares to get US bookings for their European ships. Royal Caribbean for one has half its fleet in Europe this summer. Although it has decided to switch its Navigator of the Seas from the Mediterranean back to the Caribbean this autumn a little earlier than planned, it is nevertheless quite confident about Europe for 2012. As opposed to North Americans, European cruisers seem willing to pay a higher price than their more cost-conscious cousins across the pond in a time when the American economy is suffering. And they are willing to pay in stronger Euros. American cruise lines send their ships where they can make the most money and Alaska’s loss when it started applying a $50 head tax has thus become Europe’s gain. On top of this we now have more true European cruising brands, with many more ships than a decade ago. Lines such as Costa and P&O have been around for a long time, but their fleets have been greatly expanded since being taken over by Carnival Corp & PLC. So have those of new brands such as Aida Cruises and Iberocruceros. And other European lines such as MSC Cruises, Pullmantur and Louis have added more ships to the European roster. But in order for Europe to overtake North America as a source market these differentials will have to be maintained and many more newbuildings will have to be completed for European brands than North American brands. Only time will tell for sure. Whether the world’s largest island or its smallest continent, there is no question that Australians have as much affinity to the sea as Britons. This was confirmed recently when the International Cruise Council of Australasia released its 2010 statistics, indicating that a record 466,692 Australians took a cruise last year, a rise of 27% on the 366,721 who did so in 2009. Equally, 42,886 New Zealanders cruised in 2010, up 36% on 2009. 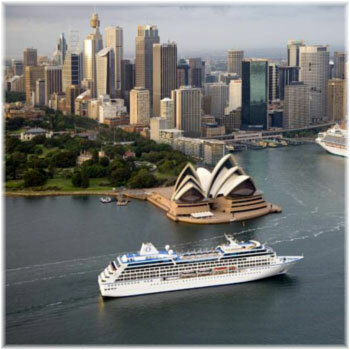 Australia and New Zealand, along with Brazil, now constitute the fastest-growing cruise market in the world. This all seems to go to prove what many say, that if you bring the ships, the passengers will fill them. But it is also a sign of Australia’s strong economy, as it escaped the main effects of the economic turmoil that started in 2008 as well as its much-strengthened commodity-based dollar. At the same time, penetration of the Australian market is increasing. In 2009 only 1.7% of Australia’s population cruised, but by 2020 that figure is expected to reach 4.2%. With the transfer of the two Ocean Village ships to P&O Australia as Pacific Jewel and Pacific Pearl in 2009-10, the latter now has four ships based down under year-round and Princess Cruises has another two. Beginning in 2012, Carnival Cruise Lines will also base the Carnival Spirit in Australia year-round, with on board currency switching from the weaker US to the stronger Australian dollar. Australian wines and power points will also be added when she becomes the first Carnival ship to be based year-round in a non-US market. Also in 2012, Royal Caribbean will ramp up to two ships with the Radiance and Rhapsody of the Seas, while sister line Celebrity will also send the Celebrity Solstice down under, although these will be seasonal assignments. Other ships calling on Australian and New Zealandports in the 2011 summer season have included, in no particular order, Holland America’s Amsterdam, P&O’s Arcadia, Fred Olsen’s Balmoral, the Crystal Serenity, Pacific Princess and Diamond Princess, Saga Ruby, Seabourn Sojourn, Seven Seas Voyager, Silver Shadow and Silver Spirit. From Germany, there were the Europa, Columbus, Deutschland and Amadea, and from Portugal, the Athena, which operates a full season each austral summer from Fremantle. Something else Peter Shanks revealed on his most recent visit to Sydney was that Cunard had discovered a new market with visiting friends and families who do not like to fly to and from Australia. This has of course been a prime market for P&O ever since the days of the £10 assisted emigrant passages from the UK to Australia, but today seasonal passages to and from the UK are offered by all of P&O, Cunard and Classic International Cruises. At its peak in 2008, San Diego hosted 255 cruise departures, but this dropped to 223 in 2009, 152 in 2010 and is now predicted to reach only 103 this year. The figure for 2012 is bound to be less, possibly falling back to the more modest levels of twelve years ago, with 95 departures in 1999. The fact that San Diego should be the port to be singled out to lose two ships to the Australian trade is unusual and it means that the port will no longer have regular cruise departures for the Mexican Riviera, a trade that has been suffering of late because of events in Mexico. San Diego had already lost its only year-round Mexican Riviera ship, the Carnival Elation, to Mobile, Alabama, last year. Holland America has stated however that it will continue to offer cruises from San Diego, although its 2012/13 program has not yet been announced. Eight other cruise lines also use San Diego and it has recently gained eight more calls from Celebrity. 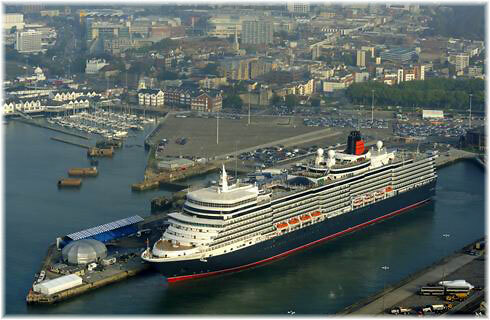 Despite two four-day weekends in a row in the UK, after Easter and the royal wedding combined with May Day, hundreds of UK cruise agents descended on Southampton for a thee-day convention that took place on four different ships while they were in port last week. Cunard Line’s Queen Elizabeth, Fred Olsen’s Balmoral, Royal Caribbean’s Independence of the Seas and P&O Cruises’ Aurora all became venues over the three-day session that began on Tuesday, May 3, and ran through Thursday, May 5. Top speakers this year included David Dingle, ceo of Carnival UK (P&O. Princess and Cunard), Andy Stuart, executive vice-president of global sales for Norwegian Cruise Line (himself a Brit, although now based in NCL’s Miami head office), Jan Swartz, executive vice-president of sales & marketing for Princess Cruises, Mike Penning MP, under-secretary of state for transport, and Michelle Mone OBE, co-founder of lingerie firm Ultimo. Constituting Europe’s largest cruise market, with 1.62 million Brits having taken a cruise in 2010, the Passenger Shipping Association is predicting 2 million UK cruisers by 2014. Meanwhile, the German market is catching up quickly, showing 1.22 million and a 19% rise in 2010. One of the themes pointed out at this year’s convention was the growing popularity for Brits of river cruises, with European rivers having seen a 24% increase last year and Portugal’s Douro in particular an 80% rise. 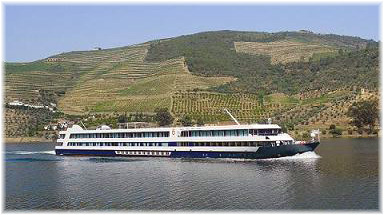 The number of UK river cruisers now stands at 124,000, for about 7.5% of the overall cruise market. The number of river operators is also increasing and their vessels are becoming increasingly more luxurious, with some of them starting to incorporate real balconies instead of French verandas. Earlier this year the Passenger Shipping Association conducted a survey of river cruisers in order better to understand the services their river cruise members should be offering on the UK market. Another theme was a claim by Andy Stuart from NCL that agents had the choice of either becoming engaged in social media or becoming irrelevant in five year’s time. Frankly, Twitter is so tiresome that it itself could become irrelevant in five year’s time, but the use of blogs and other on line means of communication is something that all cruise operators now do and all cruise agents should be looking into if they are not already doing so. While about 80% of cruise bookers still make their reservations through agents, as opposed to direct or on line, about the same proportion also do their preliminary research on line. Run by the Association of Cruise Experts, the training arm of the Passenger Shipping Association, the chief advantage of this year’s get-together though was for cruise industry people to meet and for agents to improve their product knowledge by being able to inspect the latest ships and Southampton’s cruise embarkation facilities. Although widely discussed as well, the jury is still out on the cut in agency commission paid by P&O, Princess and Cunard to 5%, with many expecting it could adversely affect sales of these lines. Stay tuned for next year to find out.